SuRie, whose real full name is Susanna Marie Cork, was born in Harlow, County Essex in 1989 and raised in Bishop's Stortford. Her artist name is a combination of her two first names Susanne and Marie. When SuRie was twelve years sold she also had residences in jazz lounges. And she performed in front of the Prince of Wales – Prince Charles. SuRie enjoyed a classic music education and can play piano and oboe. She graduated at the Royal Academy of Music in London. In the age of 16 she got the role of Fantine in the musical "Les Misérables" at the Queens Theatre, London. She now teaches at Mountview Academy of Theatre Arts in London. SuRie has also gained precious ESC experience as she was background singer and dancer of the Belgian entry “Rhythm Inside” by Loïc Nottet in Vienna 2015 (rank 4) and she was the musical director for the Belgian entry “City Lights” by Blanche in Kiev 2017. 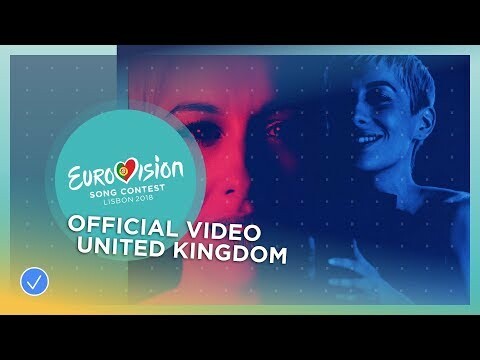 Now SuRie has the chance to act as the lead singer for the United Kingdom. It’s about how siblings belong together, no matter what storm it is. After a storm there is always the sun. The composition is not that convincing by first hearing as it has something obtrusive. SuRie is often being compared with the young Annie Lennox, may this be a good omen. It appears a bit strange that such a powerful woman with a great voice and great looks has receive his mediocre song, where a victory is nearly excluded. UK had its debut in 1957, in 1967 they could win for the very first time, when the Eurovision Song Contest was still called “Grand Prix d’Eurovision de la Chanson”. In 1958 the United Kingdom has withdrawn, so it’s one of the participating countries with the longest stand in the ESC history. The BBC had the honour to organize a special 60th anniversary concert of the ESC with previous winners and participants in 2015. It was a fulminant show with a lot of memories and melodies with an enthusiastic audience in the Apollo Hammersmith Theatre in London. Unfortunately, this concert has not been broadcasted live and the show was not broadcasted in the countries of Eurovision. Over the years the United Kingdom has become one of the most successful countries with five victories and 15x 2nd places and 41x Top10 placings. Especially in the 60’s and 70’s the ESC was very important for the UK music market, but this has changed dramatically. Nevertheless the UK entries have mostly been contemporary and radio friendly and many of them have become great hits or even evergreens. The English speaking countries always enjoyed the language advantage. Since the language rule has been eased for every country, the United Kingdom, Ireland and Malta have suffered a lot, all countries are able to sing in English or any language of their choice. Additionally the general interest has been impacted as well, which is mainly due to the funny, sarcastic and snappy comments of the BBC commentator Terry Wogan, who unfortunately passed away at the end of January 2016. There was less good will and appreciation, unfortunately the music of the ESC has been put in the trash corner with the consequence that this music event is not being taken seriously anymore. With the effect that established singers and composers make a wide berth around the ESC. Even if the BBC has send Blue, Engelbert Humperdinck and Bonnie Tyler as “old weapons” into the contest, it did not bring back the old glamourous times. It seems those singers have only been taken part for reactivating their careers. There are so many talented singers and composers in the UK, those should be motivated and encouraged instead.